global solar Archives - Solar Love! Home Tags Posts tagged with "global solar"
GTM Research has this morning published a new analysis which predicts global solar PV installations will exceed 104 gigawatts (GW) in 2018, and will continue to exceed 100 GW per year through to at least 2022. After an impressive 98.9 GW worth of solar was installed in 2017, most analysts are expecting 2018 to see the global solar sector exceed the 100 GW mark for the first time. In January, Bloomberg New Energy Finance Chief Editor Angus McCrone predicted that 2018 will see 107 GW worth of new solar capacity, while EnergyTrend, a division of TrendForce, predicted that the global solar market would install 106 GW. Just last week, IHS Markit analysts predicted that global solar demand would hit 113 GW thanks in part to a massive fourth quarter of 34 GW. 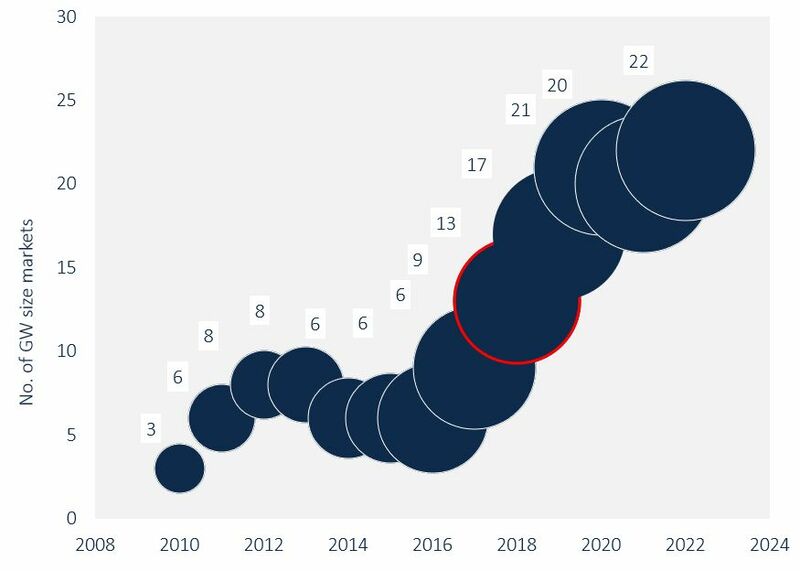 Adding weight to the argument that 2018 solar will at least surpass 100 GW, GTM Research on Monday published its latest Global Solar Demand Monitor which predicts that 104 GW worth of solar will be installed in 2018, a 6% annual growth. Further, GTM expects that annual installations will “easily exceed” 100 GW each year through to at least 2022. Maybe more interesting, however, is GTM’s expectation that annual growth will be due, at least in part, to “geographic diversification” which will make up for a decline over the top four markets of 7%. Specifically, GTM expects to see Chinese solar installations to fall by 9.4% in 2018 — though the country will still account for 47% of global demand. The United States market will stay steady in 2018, while India’s solar installations are expected to fall by around 26%. According to the report, the US market is expected to add 10.6 gigawatts of solar PV in 2018 while India will install 7.1 gigawatts. As has been suggested by many other analysts over the past 15 months, GTM Research similarly believes that diversification of the solar market will take on a geographical element, with numerous new countries stepping up now that solar technology has reached such low costs and the value of solar has been so repeatedly proven around the world. Specifically, GTM Research expects Egypt and Brazil to join the gigawatt-scale markets. GTM Research currently expects Latin America to add 5.6 GW worth of new solar in 2018, and the Middle East and Africa (MENA) region to add 4.7 GW — representing year-on-year growth of 61% and a phenomenal 281% respectively.